Neil Young News: Is Neil Young's hi-res music service PONO still a viable technology? (Click photo to enlarge)Is Neil Young's hi-res music service PONO still a viable technology? Based on yesterday's developments, it would appear the answer is "Yes". Young, who had performed the previous night at the Birmingham LG Arena, arrived at Meridian's Cambridgeshire HQ with his entourage in two tour buses, and as well as the meeting with Stuart, had a variety of demonstrations of Meridian systems, including a session in the Meridian Digital Theatre, a visit to the company's new Experience Centre, and a ride in a Meridian-equipped Range Rover Vogue. 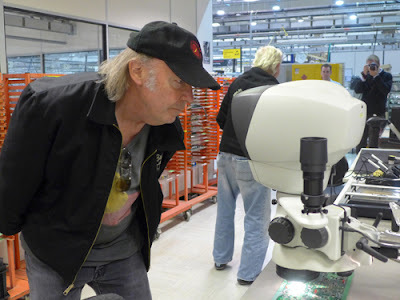 See more at EXCLUSIVE: Neil Young visits Meridian – Pono hi-res music link-up imminent? | whathifi.com. Great, he's looking through a microscope at a super high-res outer space version of his hit song "Don't Spook The Horse". Think I did read somewhere that PONO and Meridian were already working together? ERRM TIME AND TECHNOLOGY WA.......YOU GET THE MESSAGE. So should new Neil fans skip buying a nice turntable and vinyl versions of all NY's records and just wait for PONO or this still not as good as the real thing? There's a thousand new Shakey freaks turning 18 ever day and they're all starting out on stolen mp3s I'm sure but feeling a little lost as to what to actually buy next... bluRay or vinyl or pono or flac or what. Only 21st Century Digital and Pono Promise, the more recent 2012 trademarks, aren't still approved. The 2011 trademarks, the core of the Pono project, were then approved and still active.